Will We Be Ready for Halloween? Halloween 2012 approaches and you maybe remember (Recently Transferred) Commanding Officer Deputy Inspector Georgios Mastrokostas, had promised a sustained response over the years to ensure Halloween 2010 would never happen again. Halloween 2011 saw a major response and a quiet calm halloween. At last night’s 61 precinct community council meeting the 61 Precinct Commanding Officer Deputy Inspector Georgios Mastrokostas flat out asked for our assistance to prevent another dangerous Halloween in Gerritsen Beach. Halloween during hard times is still good times! 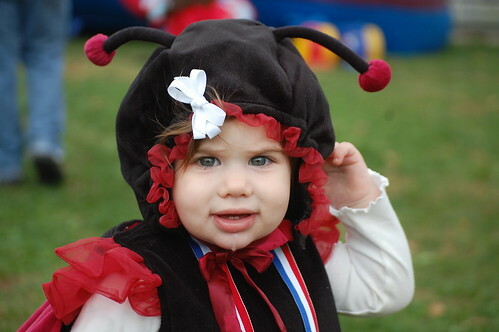 Despite the awful mischief, Halloween was also great day for Gerritsen Beach. Families and large groups came out in record numbers to walk the neighborhood in search of candy! Halloween in Gerritsen Beach is always bad, but in years past the police at least attempted to show up even if it was a lacking response. 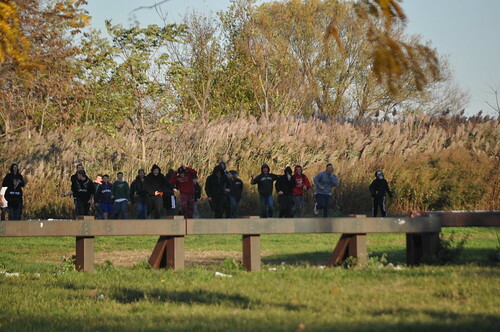 This year the teens ran unchecked by police and terrorized a neighborhood all day and night. An older man in his late 60’s was driving along Gerritsen Avenue when his car was hit by eggs, when he exited the vehicle he was pelted by dozens of eggs, rocks were thrown, chucks of brick, and someone tossed a hammer. Parents and community members stepped in to protect this man and started to chase the kids to away. As the Vollies were investigating a possible weed fire. Fire Chief John Czapp’s jeep was pelted and he was hit in the face with an egg. No police responded. NO POLICE SHOWED UP TO RESPOND. Let’s let that sink in. After possibly dozens or more 911 calls over a two to three hour period NO ONE SHOWED UP. After a few hours the 61st Precinct did sent one marked car which was pelted. But as soon as it pulled up the kids ran back weeds and the patrol car left. The kids cheered in victory. The officers did not exit their vehicle nor speak with anyone. They simply left. The 63 did send two community affairs officers who were also pelted in their unmarked car. They did exit their vehicle and pursued the teens by walking on foot to see if they can catch some of the kids. The kids being locals – immediately ran to the woodchips and exited at channel. 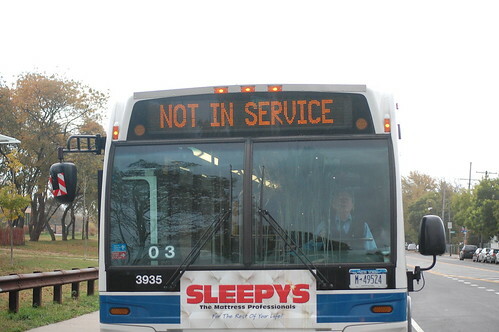 They put out of commission three buses. Shutting down the B31 line. The bus operator and bus supervisor called 911 – No response. They pelted a deliveryman on a moped assaulting him – No police response. They covered cars on Gerritsen Avenue with shaving cream. GerritsenBeach.net has been covering Halloween for years now. This was by far the worst Halloween. It was not even this bad when the previous 61 Commanding Officer Captain Stella neglected the neighborhood. At least he sent marked patrol cars and supervisors down at the last minute. However Deputy Inspector Mastrokostas seems to have abandoned Gerritsen Beach letting criminals terrorize the neighborhood, leaving residents to resort to vigilante justice. Shame on them. We’ve decided to keep the orginal post “as is”. No pictures, screenshots or names will be taken down. The pictures in question were in taken in plain sight on the street, where there is no expectation of privacy no matter what the age. Screenshots were available publicly therefore submitted to the public domain. Comments or pictures containing names cannot be verified. Their level of involvement has not been determined or proven. Everyone is innocent until proven guilty. There has been no comment by local authorities. Gerritsen Beach Halloween 2009: Great! Although Halloween had its up’s and downs this year the majority of the day was great. In part thanks to the efforts of groups like GBCares who ran their family day event this year on Halloween. The GBCares event was great, it was just like ocktoberfest, only this time there were more family’s and most were in costume! Family commented saying it was very eat to stop by as they were trick or treating. 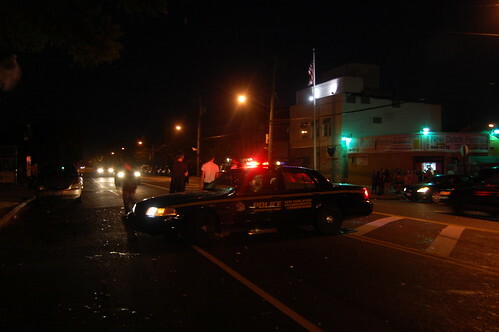 Continue reading Gerritsen Beach Halloween 2009: Great! Gerritsen Beach once again lived up to its reputation as one of the worst Halloween Mischief neighborhoods in Brooklyn. It was an evening of: Â Eggs, Shaving Cream and Toilet Paper. Since this Halloween fell on a Saturday, neighbors and trick or treaters alike didnâ€™t know what to expect, but were very glad to see the 61st precinct out very early confiscating eggs and shaving cream from local teens. The officers (above) patrolled for a many hours stopping kids on the avenue and courts confiscating shaving cream & eggs, and searching bags whenever they could. Just like years past, Â the usual large groups formed in front Victoras and across from New Dutch. 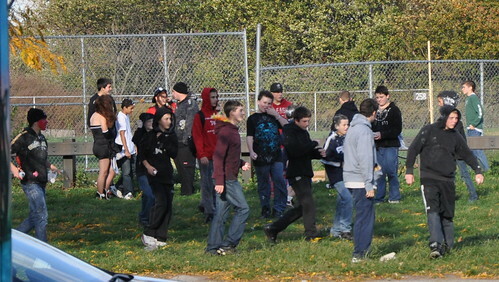 Â Some of the stupider, braver, older, kids (21+), when â€œrearmedâ€, would make their way across the street to the softball fields every now and then in preparation to egg traffic. The softball field provides a very quick getaway into the weeds if confronted with police or angry John Q citizen. This same group pelted a NYPD Auxiliary van as it drove by causing a chase between Auxiliary and 61st Precinct officers. The chase did not result in any apprehensions. Later in the evening everything was getting hitâ€¦. from random cars, FedEx trucks, buses, deliveries, even a State DEC (investigating ETO?) marked car was pelted with a few eggs, Â they threw on their lights and sirens which dispersed the crowd. As far as we at GerritsenBeach.net know the B31 was not shut down. However, one a few buses did bring themselves out of service because they couldnâ€™t see out of their windshield, due to eggs. The 61st precinct did a good job this year considering the attitudes and youth they were up against.